I got this saw a few months ago. I figured I like it enough to write a review. Yes, the Sawstop always leads to heated discussions. This is a review of the saw and nothing else. I will admit, the safety is what first made me look at the Sawstop, However, it is the last thing I think about when I use it. I hope I never have to make use of the braking system, but if I do, I’ll be glad I got it. Speaking of that, I have not had any false triggers as of yet, and I hope to not ever. I had a buddy help me assemble it. It couldn’t have been much easier.The instructions are outstanding. The hardware packs are in order and color coded. Seems silly to dumb down instructions on a $3k+ tablesaw, but what a difference it makes. Three or 4 hours later, it was assembled. The fence and blade were dead parallel with the miter slots right out of the box. But, from what I have read/heard, adjusting the table so the blade is parallel to the miter slots is extremely easy, and is achieved using allen keys (not a mallet). I was able to rip 12/4 hard maple fairly easily. Anything 8/4 or less is like butter. I built my own overarm dust collection unit. It works surprisingly well. That project is posted here I think it’s better designed than sawstop’s, and only cost about $50-60. When using both below- and above-blade collection simultaneously, there is virtually no dust anywhere (unless you are shaving less than 1/8” off the end of a board). Removing the blade guard/riving knife takes about 5 seconds, could not be easier. The included zero-clearance insert is beveled on the underside, allowing you to tip the blade. I give this saw 5 stars. I absolutely love it. The safety is a bonus. I am not complacent. That spinning blade does not see any less scary than it did on my old craftsman. Congrats on the beautiful saw! I am happy for you. Can’t help being envious. despite the arguments that develope when we talk about this brand. It’s very cool to get a new tool of this caliber,that is a pleasure to use and look at. sweet!!! greengreengreengreen with envy here… congrats on a cool tool! That’s an exciting day to get those boxes. I hope you love your saw. I’ve got this same setup. I think it is a pretty sweet saw. There are some annoyances, but if my shop burned down I’d buy another one just like it. Hey Greg – what annoyances? Just curious. The old Unisaw it replaced happens to be 34 1/8” to the top of the table. ie: “near as make no difference” but the SS is the taller of the two. 8My Ryobi BT3100 is 38” floor to table, and is a VERY comfortable height for me… Riser it is for me! Damn, that thing’s so pretty it’s a shame to get sawdust on it! Nice saw I am holding out for a Powermatic myself and I know they have their own blade stopping technology in the works I may wait for it I may not. I think that the saw stop would be my third choice even if it didn’t have the saw stop feature. I would be waiting for the new made in the USA uni saw before a saw i saw not sure about. 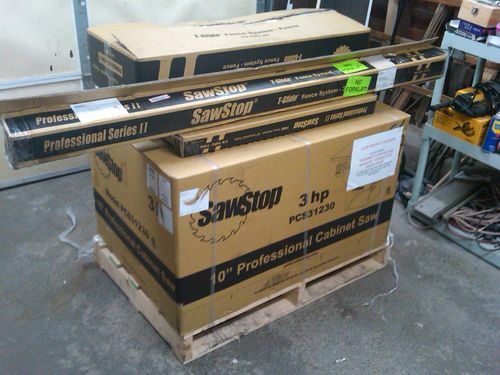 I have a need for a 5 hp saw and that is what i am going to go with. a 52 inch fence and a left tilt arbor. I know there is a reason for the left tilt but i don’t recall what i was making when I had the trouble but one thing for sure it was important at the time and i was cursing my right tilt saw that day. I am very pleased that you got the saw of your dreams I hope i can get mine soon as the old jet has lots of miles and is a little under powered but cuts very very well.